After a long long break from blogging, I am back. So where was I, one might ask? Lets say I was too busy having fun :) I've pretty much upgraded my life when I bought a new Sony PSP and later a Mac Mini. But the best of the devices was the PSP as it was more fun to hack it to run homebrew opensource applications. Hacking devices to run FOSS applications such as GNU/Linux has always been a time killer and personal obsession. Today I was able to share some of my experience at the FOSSEd when I demonstrated a sony PSP running a home brew FOSS application called PSP Radio to listen to an audio stream that was being broadcast by ice-cast, an FOSS audio streaming server, via 802.11b (WiFi)! 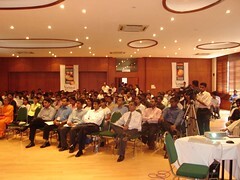 The location has been full with students, corporate people and individuals keen on broadening their understanding in FOSS. Anuradha did an excellent presentation yesterday on the different myths that is surrounding FOSS, especially among some IT literate communities . Manju Hathotuwa of the ICTA also made an excellent presentation has he usually does :) about the benefits of adopting FOSS for certain sectors such as education and government process automation. This was reiterated during the panel discussion, where I learned that the Government is moving towards the use of open standards as a first step to ensure interoperability. I hope this will push companies such as Microsoft to open up their document formats or endorse the open document format. In another presentation, I learned a lot from a talk on SE Linux (Security Enhanced Linux) developed by the NSA. 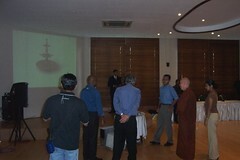 It was presented by Suranga de Silva. During the evening session there was a talk by Mr. Dinesh Fernandopulle, CIO DFCC, who was talking about how the banking industry can benefit from FOSS adoption for certain aspects of banking. He even went as far as inviting experts to help DFCC in using more FOSS applications. But probably the best talk of all was that of Brian Behlendorf, the guy who started the world's favorite web server -- Apache. 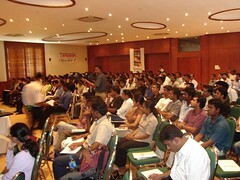 He brought few of us with up to speed with the trend towards FOSS adaption by enterprises. He also broke out some rumors about Oracle's plans to purchase Jboss (J2ee app server), Zend (major contributor to the PHP engine) and Sleepycat (developer's of Berkly db). 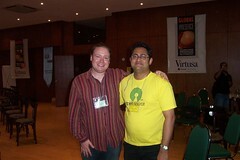 So all in all, I think FOSSEd has made some impact atleast the way people precieve Free and Opensource software. With that note, I'll sign off wishing all of you a happy valentines day. 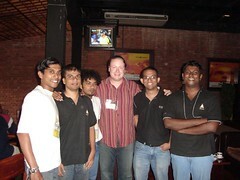 Well just to add to the after party, the guys went bolwing at Excel world and was soon joined by Sanjiva and Brian. 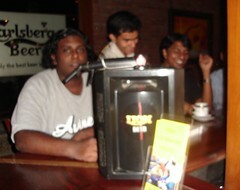 Later in the evening myself, Suchetha and Kanchana took Brian out to dinner at the Hilton for a Sri Lankan cuisine. We had a couple of beers and talked about some geeky and not so geeky stuff. Brian showed off his cool Black Berry like gadget which used to ssh to one of his servers running FreeBSD, boasting an uptime of 650 days or so.